Here at Hopkins, we have nearly 4000 Homewood students who work in departments and labs throughout the university, playing a key role in our educational, research, and operational excellence. 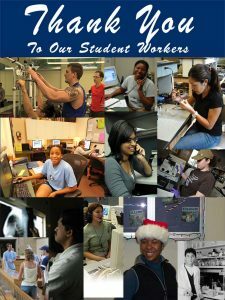 Student employees perform invaluable service with enthusiasm, dedication, and initiative. At the same time, they develop important skills and experience. Each April, Johns Hopkins joins colleges and universities nationwide in celebration of National Student Employment Week. The highlight of the week is the naming of the JHU Student Employee of the Year and Supervisor of the Year. STUDENTS, stop by our office everyday throughout the week for FREE stuff! Go to Open House for details. Take survey and you could win! We are giving away $10 gift cards to 10 lucky students. All departments are encouraged to participate; see WAYS TO CELEBRATE. Employers, take our SURVEY and you could win!